This year has been an eventful one so far, my closest friend (and bridesmaid) Holly got engaged in Thailand. Then my brother popped the question last week too, after years of waiting they put a ring on it. It took Ollie 10 years to propose to me, yeah it was a waiting game but we met young and when it did happen the time was right! It got me thinking, how many of you are waiting? And how can you hurry it along if you don’t want to be the one that asks first. When you’ve finally found the love of your life, the yearning to become theirs forever can set in strong. You may start to ask yourself how to get the process to move along faster and the truth is, you don’t want to rush it! However, there are a few ways you can let your partner know you are ready to take the next step and lucky for you, we have listed them below. The idea of ring shopping can be complicated and terrifying for most. So much goes into the decision making process, so make it easier on your partner and hint to them what you want. What kind of cut, setting and overall style do you want? Do you like diamonds, or do you like gemstones and sapphires? This is your chance to speak up and make your ring of choice known. Try hinting towards what you want by saying things like, “My friend Alison just got engaged—her ring is beautiful. 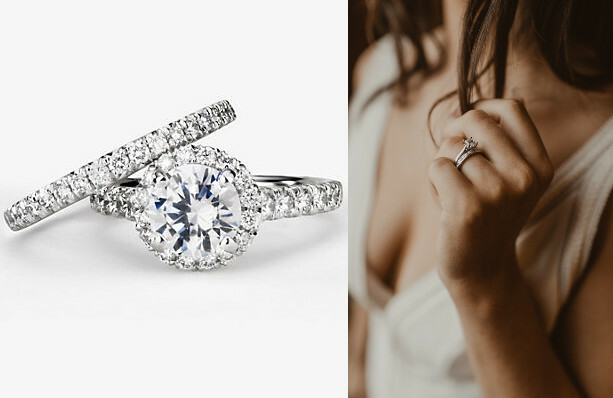 It’s perfect and I love the cut and colour etc” For a more forward approach, you can sit down with your partner and visit online jewellers such Blue Nile and browse their selection of gorgeous engagement rings to get some ideas. This way, most of the work is already done for them and it will make the selection process that much easier! There’s nothing less romantic than rushing or demanding a proposal. It is important to remember that you are not the only one in the relationship and both you and your partner have to be ready for the next step. Give things time and see how they play out before you make a move. It may seem like your partner is taking things slow for no reason, but they may have a plan up their sleeve or are simply just trying to save up enough money to purchase the ring of your dreams. Ollie’s excuse was that we didn’t have any money, not even for a ring, some places have payment plans.. there’s always a way! Start placing ads for your significant other to “accidentally come across” throughout your house around the holidays, your birthday or any day of the week in the hopes that they will get the hint. Another idea is to leave wedding magazines or articles lying around showcasing the pages you’d love them to conveniently see folded over. If your partner spends a good amount of time on their electronics, “favourite” certain web pages on their computer that feature items like engagement rings and perhaps even wedding dresses. This method has the same effect of expressing your preferences while also giving the idea that you never intended someone else to find it. And when the time is right, BOOM just like that you dive head first into an ocean of decisions that have to be made and plan a wedding! It can be stressful, but if you start saving links, pictures, head over to our Pinterest for modern wedding Inspo but when you find what you want book it asap. Visit our catalogue and pin everything! Also head to our friends page for all our very highly recommended and easy to book suppliers!